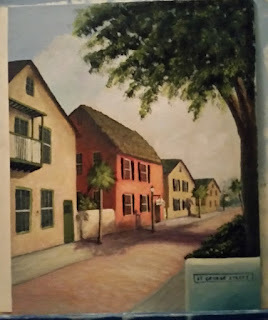 Now that I have more room, I want to concentrate on my "Scenes of St. Augustine" series. I go downtown a lot to take pictures as we are not allowed to paint" en plain aire" or on location on St. George St. or in the city plaza. So, I take lots of photos and work from them. It's not the same, but what can we do, right? 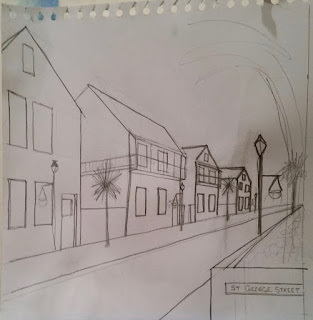 My latest is of Hypolita St. at St. George St. I took some liberties with the painting as most artists do, but if I had put in all the details, it would have been just too much. The painting would have been too busy. When I started, it was going to be important to get the perspective correct or the painting would have been doomed before it even began. 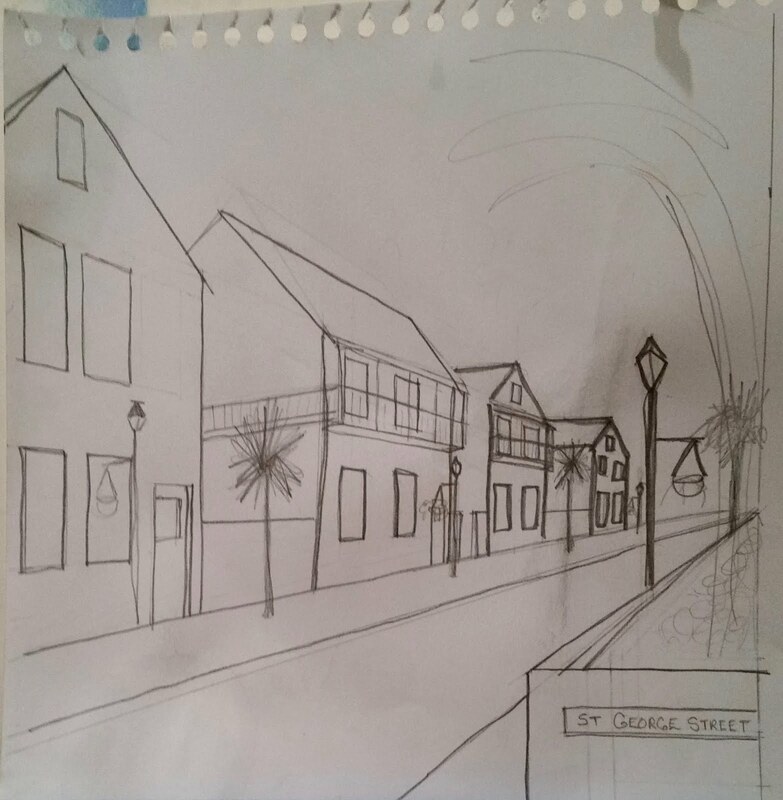 So, I sat down and drew out the street and buildings with the proper perspective lines drawn in. When I was happy with the result, I brought out my trusty graphite paper and transferred the lines right onto the canvas. First though, I had painted in my basic sky color and tinted the entire canvas. Below is a photo of the sketch. As you can see in the sketch above, I have balconies on two of the buildings. These actually exist, but I decided to leave them out of the painting as I progressed as they made for too many details which would clutter up the scene. I love being able to have that prerogative. It's an advantage that photographers lack. 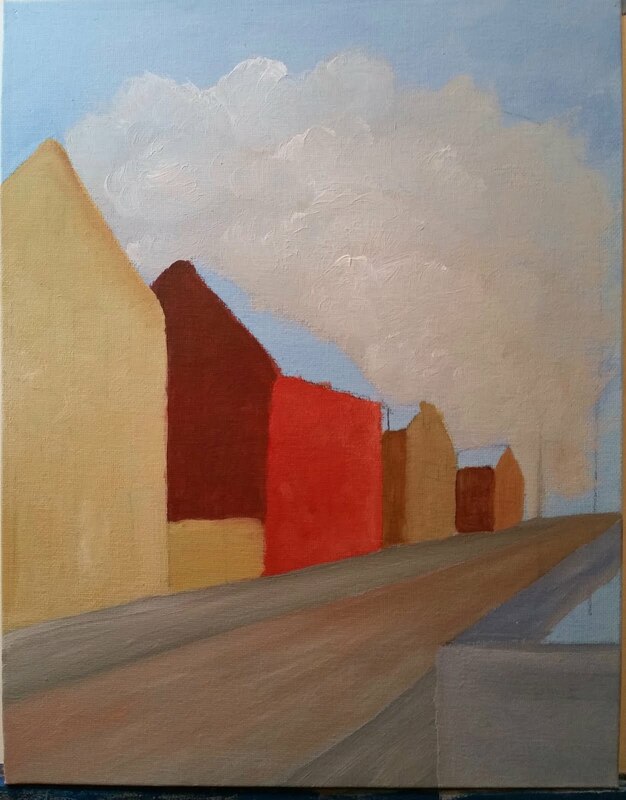 Next, I started blocking in the buildings. I decided on the color scheme I wanted to use and where I wanted the focal point to be. This is very important as too many colors and/or the wrong combination of colors can break a great composition. Try to never use more than two or three main colors as the main choice. Mix these to get complementary details. For instance, this is mainly red, yellow and green. Red and green are compliments and the yellow makes the ochre colors for the other buildings. It is very cohesive that way. Notice that the second building is bright and the others are more muted. The bright one is my center of focus. I will have all the details sharper on this building than on the others and of course the eye will be drawn to this one as well due to the color. Again, important for composition. I have laid in the street and front wall as well. These all actually exist. I am trying to put as many details as necessary to recognize the location without cluttering. Here you can see that I am starting to add some detail to the buildings but not too much yet. I am trying to concentrate on "loosening up" my brush strokes to make the paintings more romantic if that makes any sense. 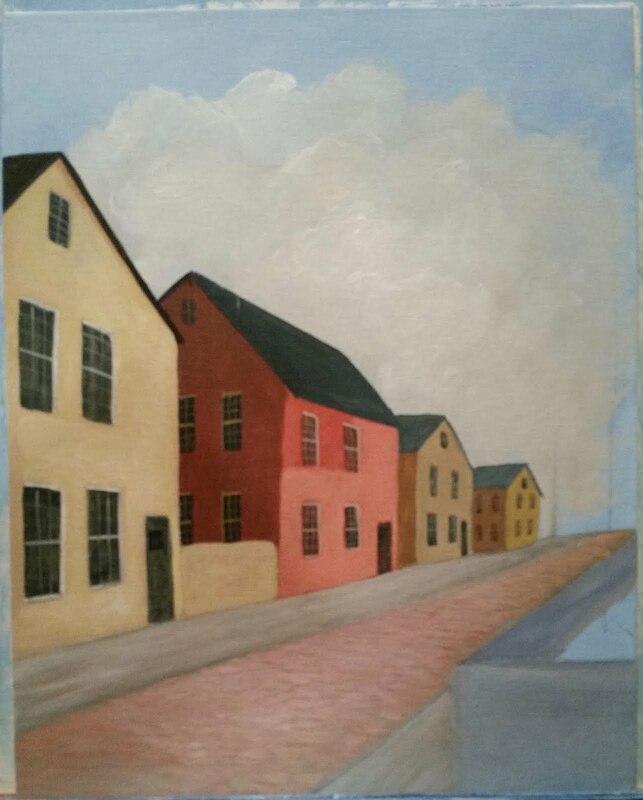 If the strokes are too tight (a problem I have) the paintings look more like an architectural painting than fine art. I have actually been taking classes from a local artist who is an impressionist. Meaning the art is VERY soft. Strokes, if looking closely, don't really depict anything. But back up, and voila, you see an image! I am not a pure impressionist. I am what is called a semi-impressionist. Soft but not THAT soft. Start looking at paintings and you will see the difference. Look up "impressionism" and you will see what I am talking about. Anyway, back to the painting. I LOVE soft paintings. They give much more emotion to a painting and seem more romantic for lack of a better description. Evoke more emotion, if you will. And that's what all artists strive for. At least we should. Emotion is what sells the painting! I study the paintings of the late Emmitt Fritz. He painted beautiful street scenes of St. Augustine in the 40's and 50's. They were simple but beautiful paintings. He employed soft lines and almost always had people in them. Not up close necessarily, but any street in St. Augustine ALWAYS has people. it's the nature of an historic city! But I digress. I am working hard to loosen up as I said, and "by golly, I think I've got it"! FINALLY! Haha..
As you can see, I decided to leave off the balconies of the 2nd and 3rd buildings, but added it on the first one. I intended to do the first one all along, it just wasn't in the drawing. 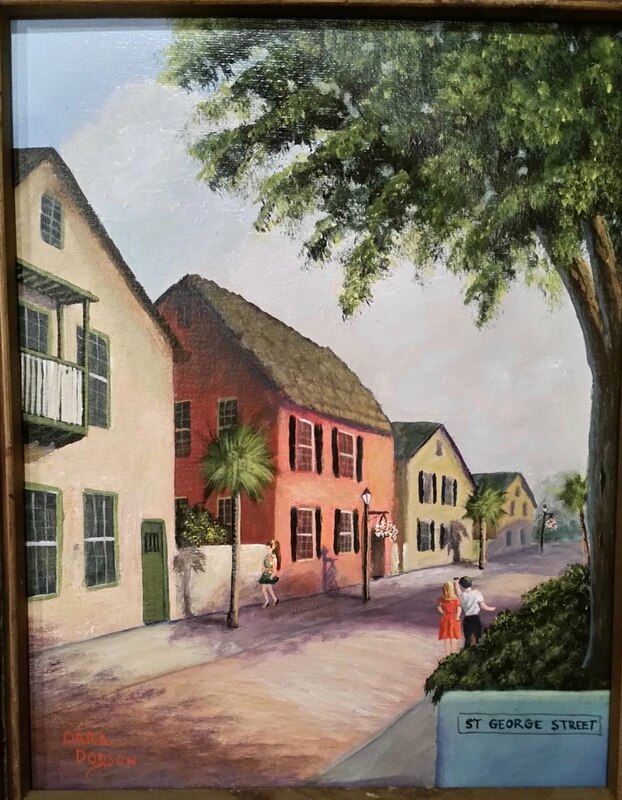 It leads the eye into the painting nicely and St. Augustine is known for the balconies, so there had to be at least one! There are also more trees and lampposts also, but again I simplified down to only those that would add not detract. Softness comes in when you look at the wood shake roof on the red house. The roof is more implied than outright detail. Also, I am varying the shades of colors on the houses. This adds much to the emotion even though it seems small. It also ties the painting together as you will see in the final photo. I went throughout the entire painting as I finished up and repeated the colors everywhere I could. Adding the purple shade color into the buildings and the wall colors into the road, etc, adds cohesiveness. I looked at the painting at this point. It was good, but lacked personality. So, I added people..more shadows and darkened the foreground. it made a BIG difference! I also lowered the front right wall. It was too "in your face" and inhibited the eye flow. The "St. George Street" sign on the wall is actually there and lots of people take their picture beside it so I wanted to be sure to include it. Notice the purple in the white wall though. Again, cohesiveness is achieved. The final photo, or almost, is below. I actually forgot to take the true final photo. After I took what I thought was the final photo, I noticed that I had forgotten to add the shadows of the people into the painting. Oops! Taking pictures is a great way to find those mistakes! I may have not noticed in time otherwise. Alas, this was at midnight..so I added the shadows...and then forgot to take another FINAL, final photo! Oh, well. It has already been hung at "Back 40 Urban Cafe". So it will have to wait until the next time I go. So, please just pretend the shadows are there, OK? I also noticed that the extra colors don't show up well in the photo, but they are there! Thanks for looking!! I hope I have given you some useful pointers today. Again, loose strokes make for much more romantic or likable paintings. They add feeling and evoke emotion. I'm not sure how, but the fact remains that it is important. People relate to them more and enjoy them, which results in sales. And after all, that is the bottom line, right?